Home / News / Sitting or standing at work – which is better? Sitting or standing at work – which is better? Research studies have found that too much sitting is harmful. Standing workstations have been widely promoted as better and healthier. However, will office workers free themselves from occupational pain and injuries by standing rather than sitting all day? Unfortunately, either standing or sitting over a long period of time is equally detrimental to health. The proper way of surviving long hours in the office is to take turns standing and sitting. Changing positions can relax the leg muscles and reduce the pressure on the lower back and legs. Research has found that intradiscal pressure (pressure in the discs between the vertebrae that make up the spine) varies with different positions — lying on the back produces 25 pounds per square inch (psi); standing straight, 100 psi; and sitting, 140 psi. Higher disc pressure is noted when sitting, as forces applied to the arms are transferred to and concentrated in the lower back. Meanwhile, standing in one position strains the muscles and joints in the lower back and legs and increases the chances of a person suffering from varicose veins in the lower legs, arthritis in the knees and plantar fasciitis (which causes pain in the heel and the soles of the feet). Correct footwear can help prevent injuries to your feet. Never wear overly high heels. An ideal pair of heels should roughly be an inch high. If the heel has worn out, it should be replaced. The use of anti-fatigue mats, which work like air-filled cushions in sneakers, can also reduce fatigue caused by standing for long periods on a hard surface. A good sitting posture should be maintained at all times while working. Rest your feet flat on the floor and keep your back straight against the back of the chair. A lumbar cushion can help support the natural curves of the spine. Use a keyboard tray whenever possible. Alternatively, keep the keyboard close in front of you. Don’t hunch your shoulders or lift your wrists while typing, which can cause chronic pains in the neck and shoulders in the long run. The best office desk would be an adjustable-height standing desk, which allows you to stand or sit interchangeably during office hours. Office workers should also rest regularly and do some stretching to relax the muscles. 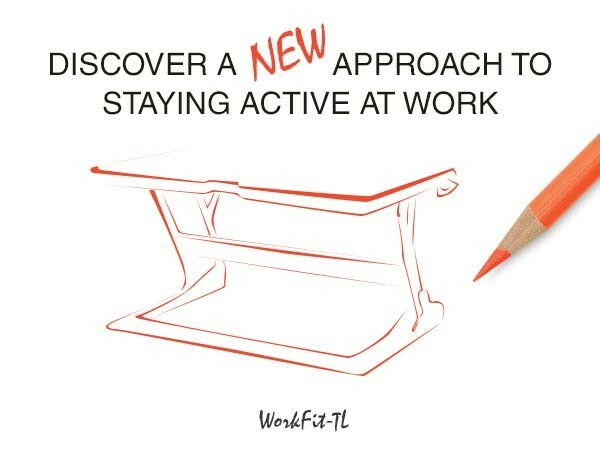 Simply place the WorkFit-TL on an open surface, stand up and you’re ready to work! WorkFit-TL features a larger keyboard tray and wider worksurface than the original WorkFit-T. Save space on your desktop because it moves straight up and down, always staying within the footprint of your desk.